David Greenspan and Stephin Merritt’s adaptation is a very clever piece of story theater, with Coraline narrating most of the events that occur to the audience. There are times when there are sudden, even jarring shifts in the scene from one location to another; she says something like “I’m somewhere else now,” and indeed we do find ourselves in another place, with the characters from the previous scene wiped away. 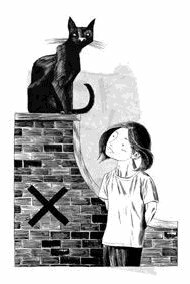 Nearly everything that happens in the play is experienced from Coraline’s point of view (except possibly for some moments with the Other Mother or the Cat when Coraline is absent or asleep, but after all, both of those characters make their own rules). Illustration by Dave Mckean from the novel Coraline. These kinds of lines and stage directions were some of my clues to interpreting the piece. In this production, Coraline is a memory play of sorts; the place that the play inhabits, while it may resemble a sort of attic with boxed up junk and rafters, is more a mental attic, where Coraline has locked up her memories of this crazy thing that happened to her when she was a kid. At the start of the play, a definitely adult Coraline comes to this place that we’ve devised - either a mental space or the literal house where all of these events once happenedand starts to unpack the memories she has. Bit by bit (during the overture, naturally), more and more of what happened to her comes to life and she becomes the little girl that she was when she first learned how to be brave. Rehearsals start Tuesday night, and I can’t wait!